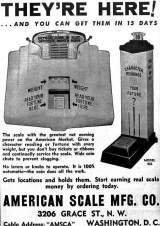 Model 403 © 1946 American Scale Mfg. Co. Floor penny scale, cast iron and sheet steel case with cast brass foot plate marked American/Scale/MFG. Co./Washington D.C.
Nickel-plated brass coin receiver mounted at top with slots for all 12 months of the year and glass window that shows your weight and fate. Base and top are cast iron with base in original black painted finish and top in red enamel, sides in steel with original white paint with Character Readings Your Future? on front and Your Weight and Fate on the sides.